Best-in-class finance marketers have embraced the power of signals. 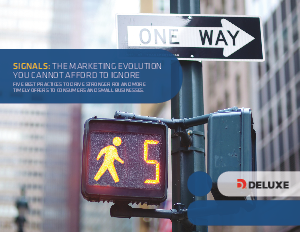 Through their everyday actions, consumers and businesses continually create signals for marketers like you. A signal is an indication of intent or behavior. Examples of activities that produce signals include making a purchase, searching online for information about a financial product, clicking on an ad, applying for a loan, and paying off debt. Each signal can be tracked, monitored, and acted upon. Reaching customers at the critical moment, in the right channel with the right message, requires keen insights about the signals they’re producing. Signals aren’t new to marketing. In fact, you may already be using new mover lists or even search engine marketing. Today, though, there is so much more valuable data available — if you know where to look and what to do with it.